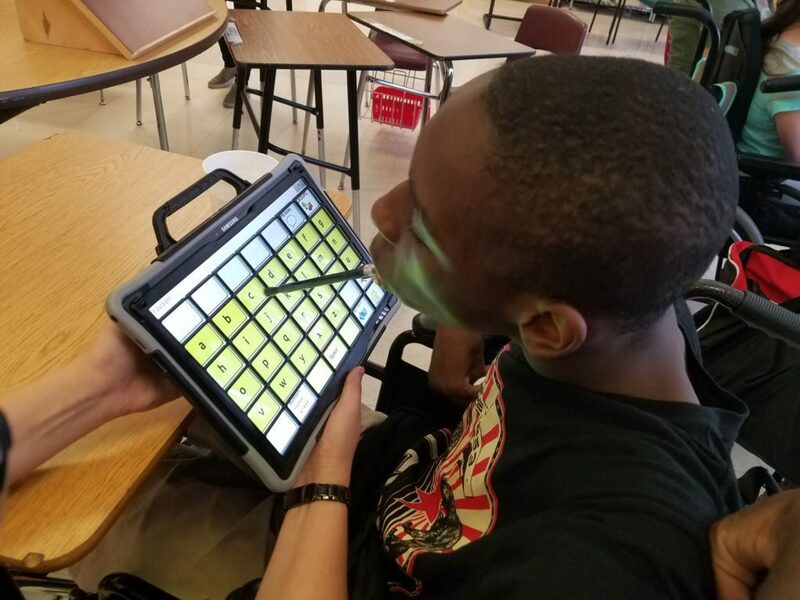 People with severe speech or language problems use various AAC methods to supplement existing speech or replace speech that is not functional. 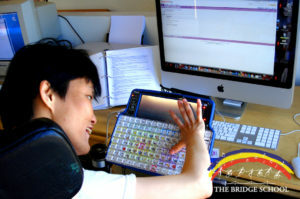 Special augmentative aids, such as picture and symbol communication boards and electronic devices, are available to help people express themselves. This may increase social interaction, school performance, and feelings of self-worth. Aided communication systems require the use of tools or equipment in addition to the user’s body. Aided communication methods can range from paper and pencil to communication books or boards to devices that produce voice output (speech generating devices or SGD’s) and/or written output. Electronic communication aids allow the user to use picture symbols, letters, and/or words and phrases to create messages. Some devices can be programmed to produce different spoken languages. 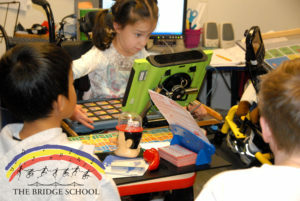 An AAC aid is any device, either electronic or non-electronic, that is used to transmit or receive messages. These devices range from low-tech to high-tech and combinations of both. Low-tech, also referred to as paper-based or rapid access communication aids are defined as those that do not need batteries, electricity or electronics to meet the user’s communication needs. These are often very simple aids created by placing letters, words, phrases, pictures and/or symbols on a board or in a book, which may be accessed. Depending on physical abilities and limitations, users might indicate the appropriate message with a body part, a head or mouth stick or light pointer. Alternatively, they might indicate yes or no as a listener scans through the possible options. High-tech AAC aids are electronic devices that permit the storage and retrieval of messages, many of which allow the use of speech output. Such devices can also be referred to as Speech Generating Devices (SGDs) or Voice Output Communication Aids (VOCAs). 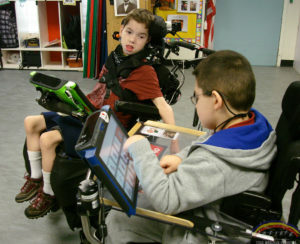 High-tech systems can be divided into dedicated devices developed solely for the purpose of communication and AAC, and non-dedicated devices, such as computers, which have been adaptedfor use as communication tool, but which can also be used for other functions. On static display devices, all the symbols are constantly displayed on the device. On dynamic AAC devices, multiple pages of symbols are possible, and thus only a portion of the symbols available are visible at any one time, with the communicator navigating the various pages. High-tech devices vary in size and weight, as well as the amount of information they can store and the way it is stored. They vary in how the user can access messages, including the use of direct selection of a screen or keyboard with a body part or pointer, adapted mice or joysticks, or indirect selection using switches and scanning. The specific access method will depend on the skills and abilities of the communicator. The representation system or symbols used in AAC include gestures, hand signal, photographs, pictures, line drawings, words and letters. 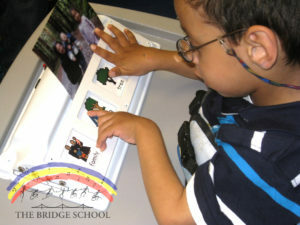 The choice of symbol system will depend on the AAC user’s abilities; many will use different symbol systems at different times. It is important to consider the individual user’s preference, visual acuity, and visual processing of information when establishing which type of pictures are appropriate for their communication system. Picture symbols are used with those who cannot read or write. Some picture systems, such as Blissymbols have linguistic characteristics, while others such as the Picture Communication System (PCS) do not. Symbols can be realistic pictures in color or in black and white, or simple line drawings. Some users understand the line drawings better than detailed colorful pictures or vice versa. Symbols can be strictly visual when located on boards or screen displays or they can be tactile such as with the Picture Exchange Communication System (PECS). With this system, the pictures are on cards for the user to move around to form a message. Tangible items can also be part of symbol systems, such as miniature objects representing their real counterpart, or small items as abstract representations. The user’s visual acuity and visual-perceptual discrimination skills will affect the presentation of the symbol system on the AAC device (e.g. determining the size of the graphic symbols or the background-figure contrast). Both low and high tech devices may use alphabet-based symbols including individual letters, whole words, or parts thereof. Literacy is required for these symbols. In low-tech devices, the communication partner may see the symbols, such as with an alphabet board. In high tech devices such as Voice Output Communication Aids (VOCAs), the device will read the message put together with symbols out loud.